The 9-hole Moanalua Golf Club in Honolulu, HI is a semi-private golf course that opened in 1898. 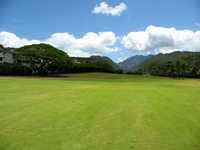 Moanalua Golf Club measures 2972 yards from the longest tees and has a slope rating of 117 and a 33.9 USGA rating. The course features 2 sets of tees for different skill levels. Greens and fairways are bermuda grass. Enjoyed. Late 9 after dropping off some family at the airport. Staff was very friendly and the course has interesting holes. Ll the greens are raised and fairly small. My son and I had a delightful round.